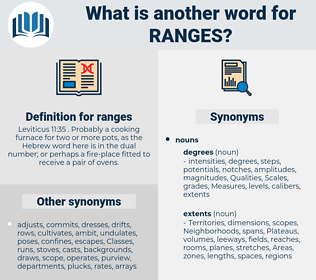 What is another word for ranges? Leviticus 11:35 . Probably a cooking furnace for two or more pots, as the Hebrew word here is in the dual number; or perhaps a fire-place fitted to receive a pair of ovens. montagnes, networks, streams, Firearms, ranks. marksmanship, sudanese, shotgun, credited, TV5, GSC, laid, slot, rank, ranks. percentages, extent, extents, gearings, fringes, Classifications, Arenas, hours, changes, rates, stages, varies, sides, margins, neighbourhoods, numbers, Neighborhoods, differences, gears, fluctuates, headings, ridges, bearings, proportions, timescales, packages, discrepancies, restrictions, differentials, series, divergences, timeframes, grades, Galleries, headquarters, ratings, levels, benchmarks, settings, reductions, edges, agents, Categories, montagnes, deviations, thresholds, variations, territoires, limitations, fingertips, collections, groupings, jurisdictions, lengths, Inconsistencies, fluctuations, sharing, perspectives, barriers, numerals, spreads, portfolios, Dispatching, ceilings, Adjustments, amounts, locations, represented, stretches, increments, ares, borderlines, amplitudes, alcances, dimensions, datasets, number, Gunners, Disparities, segments, includes, Criteria, reach, reaches, networks, spheres, tranches, streams, expansions, containers, swathes, implications, Boundaries, contours, groups, surfaces, Firearms, gearboxes, operates, realms, variants, serials, Carriers, radios, Constituencies, portions, broadcasters, parcours, spans, tiers, Habitats, quarters, frontiers, percents, parameters, sections, layers, Achievements, Journeys, AIRES, metrics, peaks, times, sub-groups, periods, structures, sidelines, scores, clusters, steps, Deficiencies, careers, ratios, values, wedges, Families, gaps, breaks, domains, sights, departures, platforms, disposition, landings, panels, FARES, brands, gangs, workspaces, Velocities, strings, shores, instalments, horizons, estates, respects, grounds, stripes, roadmaps, threads, sequences, extremes, Routing, types, sectors, Entries, bounds, constraints, borders, envelopes, pairs, minefields, zones, disciplines, pillars, yards, bands, trains, seamounts, subdivisions, shares, figures, games, Anomalies, backgrounds, streets, shortfalls, Stations, concerts, divides, limits, suites, tariffs, divisions, Prisons, sets, clutches, places, rings, districts, bars, drapes, mismatches, Occupations, boroughs, masses, contexts, Indexes, Indices, spaces, same, barracks, Phases, broadcasts, stacks, charts, Travels, strands, Territories, fetters, farms, members, Guns, Classes, systems, limites, positions, Movements, Schedules, parks, X-rays, litters, stopovers, forks, townships, Securities, rounds, fronts, links, gaols, waves, moves, routes, Paths, cookers, brackets, wings, Tracks, lots, wards, lands, polygons, strips, kinds, lapses, NODES, banks, lockers, slices, Benches, PATHWAYS, Campos, Tribes, swings, suburbs, WINDOWS, Bays, dispatch, outlets, hills, padlocks, go, jails, Bodies, rows, Keys, topics, tables, champs, Histories, shackles, pools, ropes, caps, TAPES, depots, CAMPS, Forms, rolls, dunes, data, broods, plaques, Biases, warps, subjects, points, Patches, lies, batches, pieces, works, Viruses, bins, atoms, is, webs, slabs, stands, bonds, stops, stoves, winds, digits, guys, flocks, blocks, COMMS, shocks, calls, spokes, units, slots, cooks, matches, run, runs, shifts, sorts, bolts, looks, tune-ups, locks, hubs, ducts, 's, TV5, distance, Distances, intervals, ranks. 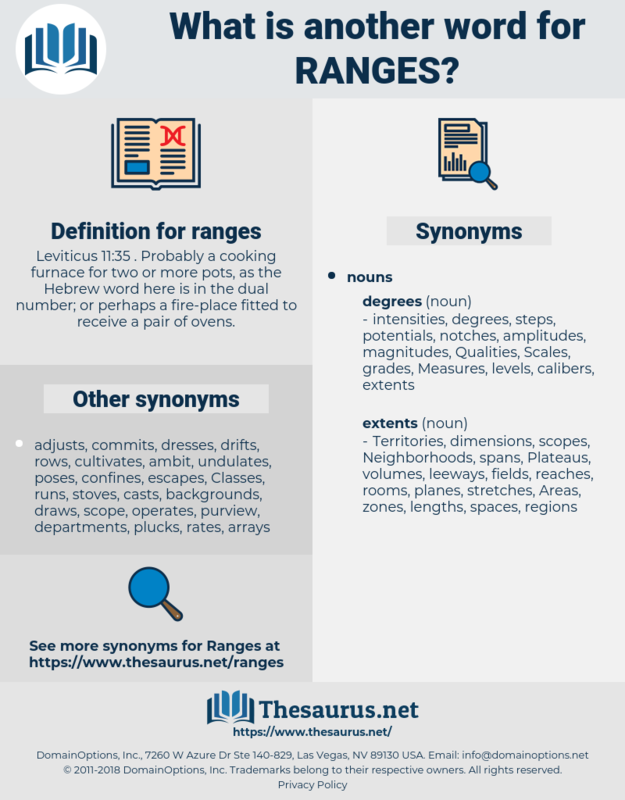 incorporates, broadens, encompass, encompasses, pertains, expands, understands, between, necessitates, extends, differs, correspond, corresponds, hangs, comprehends, determines, oscillates, Addresses, belongs, prepares, exists, embraces, relates, changes, minimum, treats, Comprised, comprises, depends, contains, grows, encounters, realizes, confronts, entails, sector, covers, involves, outlines, situates, fluctuates, Leaves, arises, locates, develops, establishes, brings, turns, embodies, leads, tends, resides, refers, captures, consists, feels, intends, draws, Les, lags, spends, spreads, occurs, Comes, requires, sways, rises, happens, goes, van, flies, includes, applies, reaches, deals, walks, befits, operates, spans, okay, hovers, Rests, SITS, fits, finds, lays, hugs, kills, falls, Focuses, suits, passes, lasts, gets, puts, builds, sets, places, wants, Travels, positions, moves, will, dates, swings, go, ai, lies, works, is, stands, matches, runs, looks, 's, intervals, ranks. rangelands, variety, Varieties, rankings, arrays, gauges, distribution, distributions, degree, degrees, variances, offerings, performances, allocations, mountains, premises, Beaches, orders, sites, speeds, timings. varied, varies, distribution, stretches, Beaches. The White Hands have an ancient feud with the Golden Dogs, and they have come from where the soft Chinook wind ranges the Peace River, to fight until no man of all the Golden Dogs be left, or till they themselves be destroyed. David turned to the brown - faced, sad - eyed son of the mountain ranges, and said: " Come along and have dinner with us, won't you?" remains, ramus, Rawness, ramous, ramesses, remaining, runch, Raunch, ranch house, ransack, rimose, renewing, rhyming, ramses, Romansh, renounce, ring, rain gauge, rank, reminisce, running, rhenish, rameses, raunchy, Romans, rumex, remus, roanoke, roaring, rung, romaic, rink, rayons, romish, remiss, ranch, Ramses Ii, roominess, romanise, rhamnus, reharmonise, rain check, romanize, renege, romance, ruining, rinse, Rumansh, rummage, rings, room access, reharmonize, rooms, runniness, riming, roman nose, Reims, running away, rearrange, rain-wash, ruinous, running shoe, rangy, Ramesses Ii, Raininess, rnase, rum nose, Rameses Ii, rowing, rhonchus, rooming house, rareness, rain gage, rhamnaceae, Remise, rehearing, romanesque, Romanic, ramose, Rheims, runic, raring, remake, raining, rhyniaceae, rearing.